From its security, and to avoid delivery trouble, we only accept EMS shipping method. Shipping will be charged according to weight, location, packaging, and in some cases overseas duties, taxes and importing fees. We will ship your package only after we recieve payment. You will recieve your package 1 week after payment is recieved. If you have not recieved your order within this time, please do not hesitate to email us. ALL OUR SHIPPING is done from Japan to where noted. We can also combine your shipping if you have purchased more than 2 items. In this case, please inform us by email when you are ready to complete your settlent. And then we will send your invoice including combined EMS shipping fee. Custom duty will be charged on your bill when the package arrives at the customs in your country. We are not responsible for any duties which are imposed on merchandises you have purchased. Your shipping fee will be determined by its weight and here is the price chart for EMS shipping. for over 2000grams, we will inform your shipping fee by email before your payment. Items will be shipped to the address provided by the customer allow 5 to 7 business days to be delivered. If your item does not arrive within 10 days after being noticed the shipment, please e-mail us immediately. 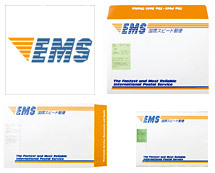 The shipment by EMS iinternational Express Mail from)Japan covers the damage and the loss of your package while transporting. Please report to your local post office if your shippment has been damaged on its way. We can not refund you when your item has been damaged on its way.